While we can’t change the humidity in the air, we can offer fresh produce that nourishes and hydrates your body. Support the folks who work year-round to bring you coffee, free range and organic meat and poultry, lots of fresh vegetables, maple syrup, handmade soaps and lotions, eggs, lovely preserves and mustards as well as tasty baked goods! Please don’t forget we moved back outdoors in May, which means we are at 150 Depot Street in Downtown Bennington every Saturday from 10am to 1pm through October. 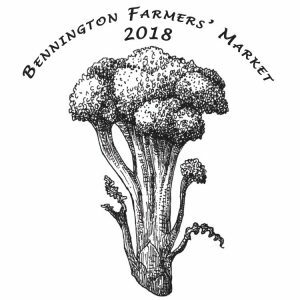 You can become a Bennington Farmers’ Market member any Saturday this month! For $25, you will receive a custom-printed pint glass with the new 2018 design (pictured above). Additional perks of membership include an opportunity to vote at the market’s annual meeting and you will be entered into our monthly drawing for a basket of market goodies. After the heat wave, we are enjoying the cooler weather – it looks like it will be perfect for exploring the market! Support the folks who work year-round to bring you coffee, free range and organic meat and poultry, lots of fresh vegetables, maple syrup, handmade soaps and lotions, eggs, lovely preserves and mustards as well as tasty baked goods! After a couple rainy Saturdays in May, we were excited to end the month with a sunshine-filled Saturday and we’re looking forward to several more beautiful Saturdays at the market this month. Support the folks who work year-round to bring you coffee, free range and organic meat and poultry, lots of fresh greens, onions, microgreens, potatoes, maple syrup, handmade soaps and lotions, eggs, lovely preserves and mustards as well as tasty baked goods! Final indoor market is April 21! Spring is in the air as we invite you to come get grounded at the farmers’ market. Support the folks who work year-round to bring you micro-roast coffee, free range and organic meat and poultry, fromage frais and other cheeses, lots of spinach and other fresh greens, onions, microgreens, potatoes, maple syrup, handmade soaps and lotions, eggs, lovely preserves and mustards as well as creative hop products, art guild treasures, and don’t forget the daikon radish! We’re at the First Baptist Church in Bennington, 601 East Main Street, from 10am to 1pm on the 1st & 3rd Saturday of April. And mark your calendars, we’re moving back outdoors for the May 5 market! 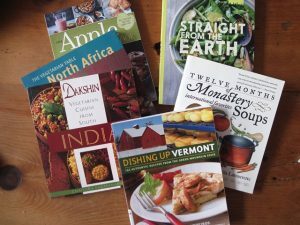 Cookbook swap: Don’t miss your chance to find new inspiration – stop by the John G McCullough Library table to swap a cookbook for one filled with new inspiration. Bennington College hosting Earth Day activities: Celebrate Earth Day with the Bennington Seed Library and a fun Earth-themed stamping activity. The Bennington Seed Library, located in Bennington College’s Crossett Library, is a collection of vegetable, herb, and flower seeds that community members can borrow for free. People grow the plants in their yard or community garden, harvest seeds from some of the plants they’ve grown, and return to the Library to replenish the collection and share the seeds with others. Membership for the seed library is free. Join us at the April 21st market to join the library and in doing so participate in the act of both building relationships and collaborating for the sustainability of Earth. Can’t make it on April 21? Keep up with the library on Facebook and their website. Entertainment: Sam Diedrich (piano, vocals) and Leo Cohen (guitar) make up two thirds of Bennington College band, Aviation. Thank you to all who participated in our first cookbook swap at the market last month! Due to the popularity of the recent cookbook swap, the John G. McCullough Library will continue offering the swap table at coming markets. Peruse your cookbook shelf to trade in gently used cookbooks for fresh culinary inspiration with your fresh market fare. As part of our ongoing commitment to supporting community wellness, the Bennington Farmers’ Market will present an information session on transitioning to a vegan lifestyle Saturday, March 17. Mount Anthony Union High School sophomore and food enthusiast Gabriela Griffin-Leon will begin her talk at 10:30 AM in the Lounge of Bennington First Baptist Church. At Griffin-Leon’s information session she will discuss how she began her vegan journey, how she maintains a healthy vegan lifestyle in social settings, and even share some recipes she has created for mac n cheese, corn chowder, fat-free French fries, and blondies! We know Punxsutawney Phil saw his shadow, but we hope you won’t let that discourage you from visiting our winter market! We invite you to come get grounded at the farmers’ market; support the folks who work year-round to bring you locally grown produce, handmade products and other delicious treats. Forgot to bring cash, but want to purchase goodies at the market? We have you covered – you can always stop by the manager’s table to use your debit or SNAP card to receive market tokens. Looking for new recipes? The John G. McCullough Free Library will host a Cookbook Swap at the market on Saturday, February 17th from 10:00AM to 1:00PM. Bring along cookbooks and other food-related books you’re ready to part with and exchange them for others! Out of respect for your fellow swappers, books should be in good condition. Every child who stops by this booth will receive a free gently used book to keep! Thanks to everyone who came out for the Mac and Cheese Cook Off! Eight competitors brought crock pots full of unique mac and cheeses and we raised about $570 for Meals on Wheels! Thanks to all who participated! This event is first and foremost a fundraiser for Meals on Wheels and designed to promote fun! Tables, serving utensils, and power will be provided. Bring entry(s) to the First Baptist Church, 601 Main St., Bennington by 9:30 on January 20 and plan on being there to serve (there will be people who can spot you for bathroom breaks, etc.). We’ll begin selling tickets at 10 a.m. and continue untill about 12:30, when votes will be gathered and counted. Winners will be announced around 12:45. Samples will be approximately 1/3 of a cup, about the size of a ladle or large serving spoon. A list of ingredients must be provided near your entry for those with food allergies. Judging is done by attendees, who purchase tickets for $1 each or 6 for $5. Each ticket entitles the holder to one sample and one vote. The more samples you sell, the better your chances of coming in first, so it pays to get as many of your friends and family members to come out. Tell them to vote early and often! The top three entries will win a wooden spoon (gold, silver and bronze) as well as other prizes. The top vote-getter wins a $50 gift card from King Arthur Flour. Thanks for your interest and good luck!!! It’s time to dust off the cheese graters and casserole dishes for the Bennington Farmers Market’s Second Annual Macaroni and Cheese Competition to benefit the Bennington County Meals on Wheels program Saturday, January 20. Last year’s event was a big success with more than a dozen delicious dishes delighting the palates of attendees. More than $400 was raised for Meals on Wheels, the figure to beat this year. 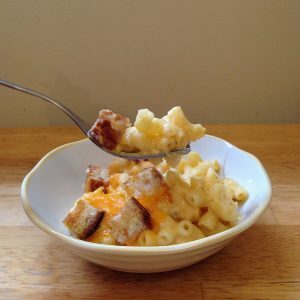 Over $100 dollars in prizes have been provided by the King Arthur Flour company, including a $50 gift certificate for the chef who creates the winning mac and cheese. Entrants pay a $5 entry fee and bring a large slow-cooker full of their best Mac and Cheese. Patrons purchase tickets which give them samples and votes. Everyone leaves with full stomachs and the satisfaction of participating in a good cause. Individuals and groups are encouraged to join the fun as chefs or samplers. Interested cooks may sign up at the Bennington Farmers’ Market manager’s table Saturday, January 6 from 10 a.m. to 1 p.m. at the First Baptist Church in Bennington, 601 Main Street, or by contacting Audrey Pietrucha at vermontvanilla@gmail.com.